You have heard the phrase “good things come in small packages”, well whoever coined the phrase must have been thinking about miniatures. You know, those little arrangements that capture the imagination and fit into our ever-growing smaller living accommodations. What is a miniature design you ask? A miniature is “a design with maximum dimensions of 13.3 cm (5 1/4″) in any direction (height, width, depth and diagonal). For good proportion, the container should not exceed 3.5cm (1 1/2″) in height. Appeal is greatly enhanced when exhibited in appropriately sized niches. Niche size 14 cm (5 3/4″) wide x 15cm (6″) high and 13.3 cm (5 1/4″) deep is recommended. To be viewed at eye level.” Ontario Judging Standards. 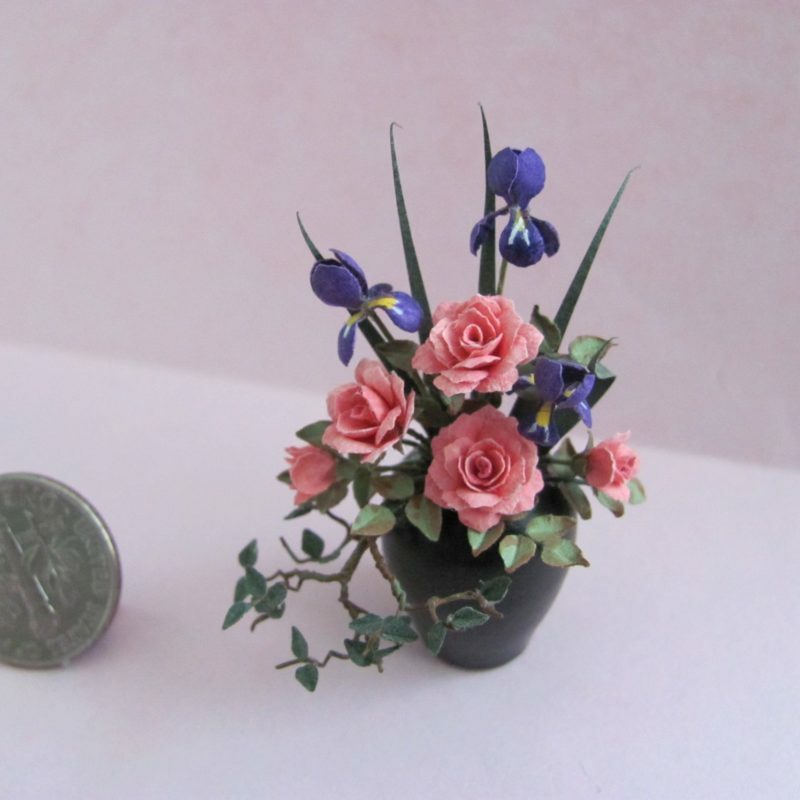 The most important element when creating a miniature floral design is scale. You must pay close attention to the relationship of size in each part of the design, each flower should be compared to the others in the arrangement, the flower(s) should be compared to the containers; any base or accessories should be compared to the container and the design as a whole. And the size of the whole design should be compared to the niche in which it will be displayed. No flower should be more than one-third the size of the container. Select plant material carefully, consider cedar, ivies, spirea, barberry, heather, Hydrangea florets, artemisia, cedar, baby’s breath, grasses, coral bells, miniature roses, ferns, hers like thyme and parsley, Queen Anne’s lace, and mosses, things that will be in scale with your container. Condition fresh materials before you start. Caps off toothpaste tubes or pump aerosol containers can be painted a colour to harmonize or contrast with your design. Once done, put your masterpiece eye level where it can be seen and frame the design in a small shadow box of the appropriate dimensions. If you are a Garden Club of Toronto member consider entering a miniature design in the Toronto Flower Show at Canada Blooms. The schedule will be online by the beginning of November, so start planning now! And if you aren’t a member, come and try your hand at making one during one of Toronto Flower Show’s pop-up demonstration/mini workshops. Watch the web site or newsletter for the dates and times closer to the festival!